‘Green’ hypocrisy is the new ‘black’. The pointless slaughter of millions of birds and bats by wind turbines, all over the globe is just another ‘inconvenient truth’ for the wind cultist. And when we say ‘pointless’, we mean utterly pointless: in the absence of massive and endless subsidies the wind industry would disappear in a heartbeat; the election of Donald Trump (an avowed hater of wind farms) was enough to cause the shares of wind turbine makers, like Denmark’s Vestas to plummet. The propaganda parrots that spruik the “wonders” of wind power have been telling us for years now that it’s a “product” with all the admirable characteristics of the REAL stuff, that’s so cheap it should be jumping off the shelves. Those from the wind industry’s more deluded fringes even run the ludicrous claim that wind power is (now) actually cheaper than coal-fired power – see this piece of twaddle from ruin-economy, for example. All over the Globe, wind industry spin-masters tie themselves in knots, trying to turn fantasy into reality. Here, the wind industry and it’s spruikers – like, Tristan Edis (see our post here) – keep telling us, over and over again, how cheap wind power is by comparison with conventional power sources – a story being pitched up lately in order to counter mounting anger at the damage the Large-Scale Renewable Energy Target has done to real industry and real jobs. Having boasted about the wonders of their product – and its ability to “compete” with the big boys – in the very next breath, these subsidy leeches start wailing – like crazed little brats – at the prospect of there being so much as the slightest interference with a stream of subsidies, so massive that their scale makes Croesus look like a penny-pinching pauper. Either wind power is economically viable, or it isn’t? If the former, then there’s no need for mandated subsidies and/or massive penalties, at all. Trouble is, the conduct of the actors – as is usually the case – reveals the teensy, weensy flaw in their ‘case’. If wind power really is competitive with coal and gas, then wind power outfits have no need for subsidies, mandated targets, or guaranteed, fixed-price government contracts at all. the price for the pleasure of our chaotic, unpredictable power “supply” will be fixed for 25 years at 4 times the price charged by those “evil” fossil fuel generators. It’s little wonder that – in the absence of fines and penalties that force retailers to sign up to take wind power (see our post here) and/or massive subsidies (see our post here) – no retailer would ever bother to purchase wind power on the standard “irresistible” terms above. 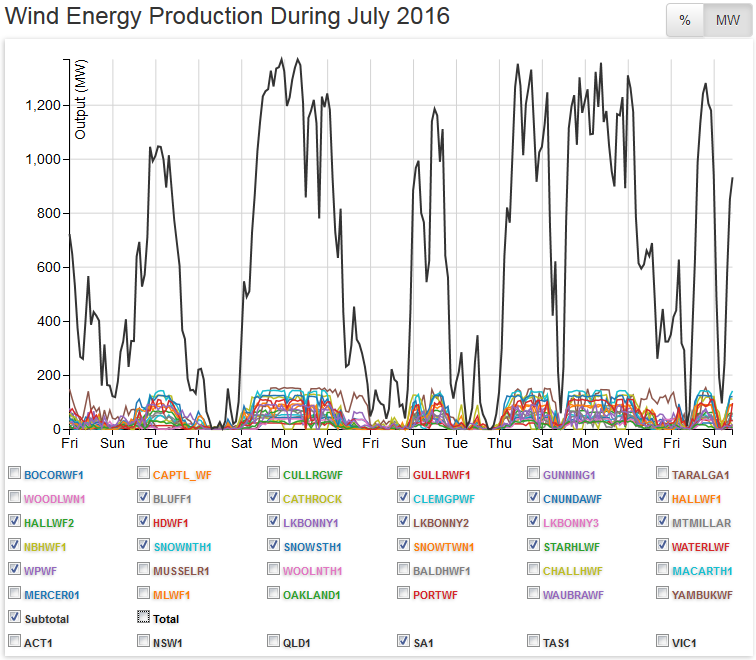 There is NO market for electricity that cannot be delivered on demand – wind power has NO commercial value for that very obvious reason (see above, the output from SA’s 18 wind farms during July). The “demand” that exists is nothing more than legislated policy artifice – in the absence of mandated fines, penalties and/or endless subsidies the wind industry would have never got going at all. Any policy that is unsustainable will either fail under its own steam; or its creators will eventually be forced to scrap it. Endless streams of massive subsidies for a meaningless power source fits the “unsustainable” tag to a T.
The wind industry has been telling the world it’s almost ready to stand on its own two feet for over 30 years (see our post here). Now, to the pointless carnage caused by a power source abandoned centuries ago for pretty obvious reasons. Wind farms are killing about 200 bats a month in the UK, say scientists who have called for turbines to be turned off at night to save the creatures. Bat-friendly operators who agreed to take such a step should be paid more for the electricity they generate, said Fiona Mathews, a biologist from Exeter university who led a government-backed study of 29 onshore wind farms. Some wind farms were already testing night-time switch-offs and researchers were watching to see what effect this had, she revealed. “This approach obviously affects electricity generation, though to a lesser extent than one might imagine since the time that bats are at most risk is during low wind-speeds in the summer” when turbines generate relatively little electricity, Ms Mathews added. The study showed 194 bats were killed per month, based on carcases found underneath the turbines. The actual number could be higher because scavengers may have removed some bodies. The researchers said more work was needed to find out why bats ventured so close to the farms. It is thought the animals might be attracted to insects around the blades, or may switch off their sonar at the height of the blades because they are not used to confronting objects of that size. “Bats have been around for at least 30m years and during that time have been able to fly happily without the risk of colliding with a spinning object,” said Ms Mathews. Erecting gigantic bat-proof nets around the turbines would be no solution because it would interfere with wind flows, Ms Mathews said. US researchers had also run into difficulties when experimenting with loud sounds to repel the animals, partly because the electricity needed to power the speakers was a significant drain, she added. One wind farm operator said although he was unaware of any bat deaths near his company’s projects, he was not sure that it would be politically possible to pay generators to turn off turbines. “If we are not generating power we should not get paid,” said Rod Wood, managing director of the Community Windpower group, which has eight Scottish farms operating or under construction. 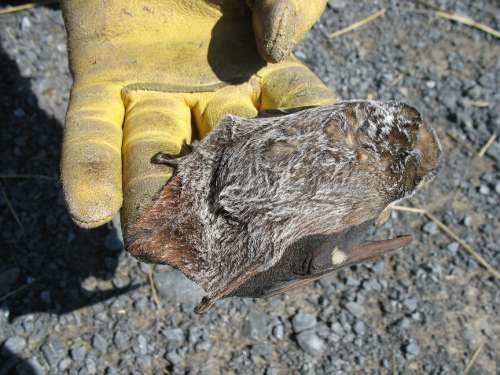 The new study showed the main bat casualties were two common species, the common pipistrelle and the soprano pipistrelle, tiny bats with reddish-brown coats and blackish-brown ears. But researchers also found a dead migratory Nathusius’s pipistrelle, which they said raised concerns about whether onshore and offshore wind farms could pose a threat to navigation routes. “These animals will be encountering multiple on and offshore wind farm sites as they make their way from eastern Europe along the north coast of continental Europe and across to the UK,” said Ms Mathews. The researchers said that although huge amounts of money were spent to assess environmental risks before wind farms were built, this work was “very poor” at identifying whether a site was likely to be risky for wildlife once a wind farm was operating. “We therefore call for a switch in emphasis from pre-construction to post-construction assessments,” said Dr Mathews. The research was funded by the government-backed Natural Environment Research Council and drew on data collected in separate studies funded by the environment and energy departments. RenewableUK, the wind industry trade group, said it had been working with the government and conservation groups for years to better understand bat activity around wind farms and carried out “rigorous assessments” to make sure projects were as safe as possible. Endangered bats are being wiped out by wind farms despite efforts to reduce the risk, an Exeter study shows. The legally protected mammals are killed while hunting insects attracted by the heat that is generated by the spinning turbine blades. Costly environmental tests called EcIAs (ecological impact assessments) completed prior to their building have failed to stop the fatal collisions, say scientists. Professor Fiona Mathews, of Exeter University, said: “The findings highlight the difficulty of establishing with certainty the effect of major developments before they occur. “This is a real problem for the planning system. “In most countries the system of Environmental Impact Assessment is based on the assumption accurate assessment of risks can be made in advance and so appropriate steps can be taken to avoid any adverse effects – or if the bad effects cannot be mitigated, then the development should not be permitted to go ahead. She said EcIAs cost tens of thousands of pounds – if not more – to carry out because people have to go out at night and during the day for a year, possibly more. She said: “It’s difficult to say exactly how many bats have been killed by wind farms in because it’s very difficult to work out. “They are small and brown and although some people may not like them they play a very important part in the environment. “The tiniest can eat 5,000 midges a night. 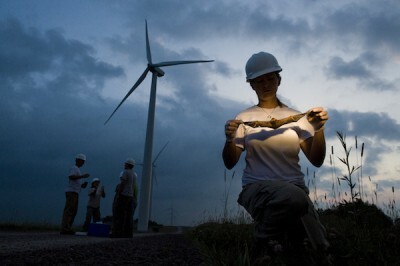 Her researchers surveyed 46 wind farms across the UK for bat fatalities over the course of a month. It’s extremely difficult to find dead bats so they relied heavily on search dogs to locate casualties as well as using audio analysis to characterise bat activity. Most bat species weigh less than five grammes. The researchers also found the mitigation measures put in place at sites determined in advance to present a greater risk to bats have not provided adequate protection. Bats continue to be killed. Prof Mathews said EcIAs might not be conducted in a sufficiently rigorous manner. It’s also possible bats change their behaviour once wind turbines are erected. 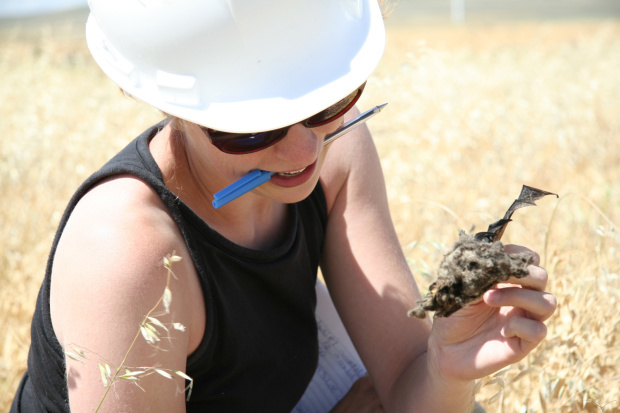 She called for more thorough assessments prior to building along with careful study of casualties post-construction and their impact on local bat populations. She said: “We need to remember bats have been around for at least 30 million years and during that time have been able to fly happily without the risk of colliding with a spinning object. 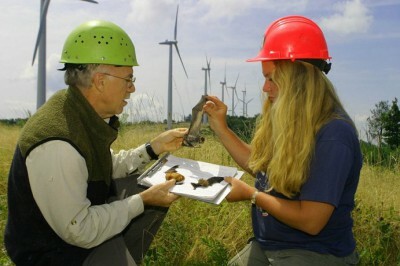 Prof Mathews said it’s important now to determine whether bats might actually be attracted to wind turbines. Meanwhile the most straightforward approach to keep bats safe is to minimise the rotation of turbines at night in the summer and early autumn when bats are most active. Some operators are embracing this approach and she and her colleagues are working with them to test the method. Bats can mistake wind turbines for tall trees because the air currents are similar. The nocturnal creatures are welcomed by farmers across the world as they eat large numbers of insects that usually damage crops. This reduces the amount that farmers have to spend on pesticides and saves millions of new plants that could be obliterated by the creepy crawlies. Over 600,000 bats were killed by wind turbines across the USA in 2012 alone and in the UK the number of bats in areas where they are put up have fallen by 54 per cent. Hundreds of bats are being killed in collisions with wind turbines in the UK each month, despite ecological impact assessments predicting that many windfarms were unlikely to affect such animals, according to a new study. All UK species of bats are protected by law, and ecological impact assessments – carried out before construction of windfarms or other sites – should weigh up the risks for local habitats and wildlife. But new research suggests that such assessments are simply not up to scratch. Using sniffer dogs, scientists at the University of Exeter report that they hunted for bat carcasses at 46 windfarms across the UK, 29 of which had ecological impact assessments available. For 18 of the sites the assessment reported that a windfarm would be unlikely to affect protected species, or an investigation into bat activity was unnecessary. However the researchers found that nearly all of the 29 sites showed evidence of bat activity, while half had seen collisions between bats and wind turbines with estimated death rates of up to 64 fatalities per month, taking into account factors such as possible removal of carcasses by predators. Among the sites flagged as posing a high risk to bats, the authors found that efforts to reduce the impact of wind turbines had had little effect. “The sorts of mitigation that have been used, like moving the turbine a bit further away from woodland, just wasn’t doing the job,” said Dr Fiona Mathews, lead author of the research that was published in the journal Current Biology. The authors conclude that ecological impact assessments do not adequately predict the risk of windfarms to bats. But it is not clear whether the failings are down to changes in the behaviour of bats after windfarm construction, or are simply down to poor surveying of the area beforehand. As well as improving pre-construction surveys, the authors say that assessments should be carried out after windfarms have been built, while better approaches should be developed to reduce the chances of collisions – such as re-positioning the turbine blades out of the wind at night during periods in the year when bats are most active. More research is also needed into why the bats are flying so close to the turbines, said Mathews. If only these wind turbines would kill the RIGHT bats! But then I suppose the Leftists do not fly at the correct altitude for that to be the case. The destruction of bats and birds is not the whole story, what about the insects, lizards and all creatures great and small being either slaughtered or forced into near or actual extinction by these things, their blades cut through the air while noise not only travels through air but also through the ground where many of these ‘hidden’ lost creatures once lived. It is all a matter of why did those who approved these things not ensure the safety and survival of all creatures great and small. Where here in Australia was the EPBC, why did they not demand the companies undertake significant research into what creatures were present and not just those already on the endangered list but all creatures as the actions of these turbines and their installers could cause more to have to be added to the list. Why have the scientists not been out in their droves checking on the damage these things are doing to all creatures, why has there been so little said – do all the scientists not have voices. The EPBC has been lax in its role, it takes for a given that the companies have actually undertaken the work at a satisfactory level, when reading reports it is clear the companies have in many cases been sloppy and less than efficient in their duty. The EPBC should have long ago been campaigning for independent environmental studies of areas to be undertaken with the companies paying the bill and the researchers being answerable to the EPBC not the companies. When will Governments learn it is up top them to ensure their Departments are working effectively. At every level this industry has been given a free hand to do what it likes and its time it they were made to be answerable for the damage they have caused to the environment, eco-systems, all creatures and humans. For an industry to be allowed to do SO MUCH DAMAGE without repercussions is criminal.